Warning that the dam's emergency spillway would fail. Emergency spillway was used for the first time since the dam's construction in 1968. The California Department of Water Resources issued a sudden evacuation order shortly before 5 p.m. Sunday for residents near the Oroville Dam in northern California, warning that the dam's emergency spillway would fail in the next 60 minutes. The emergency spillway, which is unpaved, was activated on Saturday morning to relieve the flow down the dam's normal spillway, where a major hole appeared in recent days and began to widen. 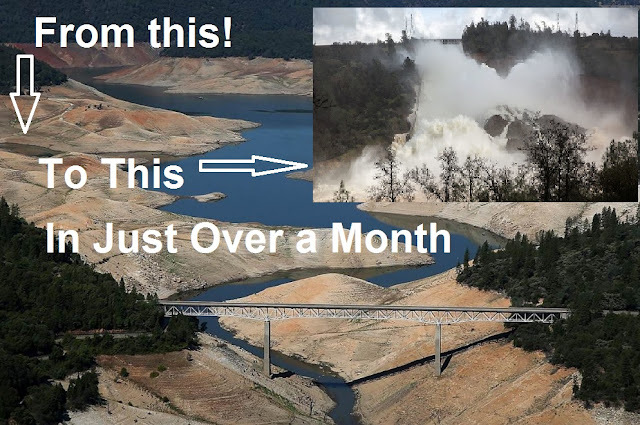 The height of the lake, once drained by drought and now swollen by recent rains and snow melt, had reached 901 feet above sea level when the emergency spillway was opened. As Breitbart News reported in continuing coverage of the crisis, officials initially assured the public that evacuations would not be necessary, because the damage to the normal spillway appeared limited. They repeated those assurances on Saturday as the emergency spillway was used for the first time since the dam's construction in 1968. Now, however, local ABC News affiliate KRCR reports that state officials warn the emergency spillway could suffer a structural failure. It is not clear whether that would lead to a structural failure of the dam itself, which would be a major ecological and economic disaster. “What they’re expecting is as much as 30 vertical feet of the top of the spillway could fail and could fail within one to two hours. Authorities said Sunday afternoon that they had increased the flow down the normal spillway to 100,000 cubic feet per second, despite the damage, to relieve pressure on the emergency spillway. The Feather River flows south into the Sacramento River. Flooding could potentially affect the Sacramento River and surrounding areas. As more than 100,000 people were ordered to flee to higher ground, officials said Sunday that the crisis at the Oroville Dam had eased somewhat as the water level at the reservoir dropped. That halted water flow from a damaged emergency spillway that officials feared could collapse. But officials stressed the situation is still dangerous and that evacuations should continue. The key to minimizing the injury caused by water or flooding is to get rid of the water as quickly as doable.